Corvey Gospel fragment, Incipit John's Gospel, Walters Art Museum Ms. W.751, fol. 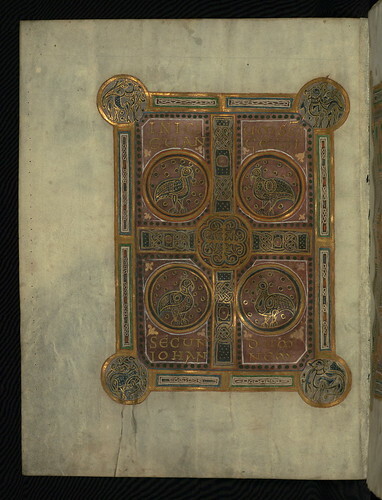 3v, originally uploaded by Walters Art Museum Illuminated Manuscripts. This manuscript consists of four folios from a Gospel Book that was likely made at the monastery of Corvey in Western Germany during the last quarter of the tenth century. Dating to the reign of Otto I, these pages offer a magnificent example of early Ottonian manuscript illumination. The heavily ornamented pages, which introduce the Gospels of Luke and John, shine with gold and jewel-like colors against dyed purple grounds. These pages combine monumental classicizing square capitals on purple grounds with rich and complex interlace. This fragment contains the opening pages of Luke (fols. 93-94) and John (fols. 137-138) that were originally part of Ms. 10 from the Bibliotheque Municipale in Rheims, a Gospel Book originally owned by the Chapter Library of the Cathedral of Rheims until it was confiscated, along with the rest of the cathedral's manuscripts, during the French Revolution. Related manuscripts include Pierpont Morgan Library Ms. M. 755 and New York Public Library Ms. 1.